Godzilla and Mother Nature: Two of A Kind! Sherrylee and I almost always choose our movies by consensus. Occasionally, however, one of us gets a wild hair and just wants to go see something that neither of us would normally choose. If I want to remind her of some crazy films that we have seen together which were her choice, then all I have to do is refer to Snakes On A Plane (2006), which is so bad that it might become a cult movie someday. Thursday night she decided we needed to see the premiere of Godzilla (2014), so we invited friends to join us and hurried to buy early tickets and beat the crowd. Before the film began, we were talking about the older Godzilla films, and Sherrylee says, “I liked the one with Faye Raye better than the Jessica Lange version.” Oops! After a little research, it turns out that Sherrylee was more right than she thought; apparently, the word godzilla was intended originally to invoke the idea of a gorilla. Gojira is the Japanese name, which is a combination of their words for gorilla and whale. In spite of the fact, that Sherrylee was disappointed not to see King Kong, I think she enjoyed the film! 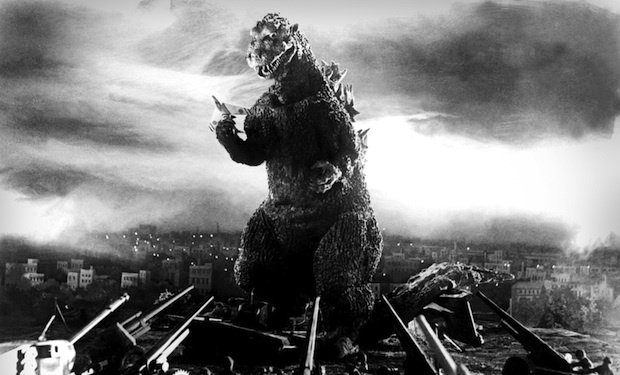 The first Godzilla film, a Japanese film, was released in 1954, and most people agree that the monster was originally a metaphor for nuclear war. This sauric creature is awakened from his pre-historic sleep by nuclear blasts, he feeds on nuclear energy, and one of his trademark weapons is his atomic breath, with which he can destroy his enemies. In later films, he even has the power to shoot out atomic laser-like beams through his eyes! Nuclear fears were behind many of the 50s monster movies, but even though Cold War fears subsided and nuclear energy became more common, Godzilla, King of the Monsters, survived by becoming a more sympathetic creature, often saving humanity rather than destroying it. Buildings, mountains, weapons, cities were destroyed, but not human existence. Interestingly, however, Godzilla is not really the friend of humanity; rather, the monster usually acts out of a sense of self-preservation. His now famous signature roar (at which the audience on Thursday night clapped in delight!) seems like rage, but the roar is more animal than human, a physical response to threat more than an emotional reaction to evil. The producer Shogo Tomiyama reportedly was asked if Godzilla was good or bad. His reply was that the creature was neither; Godzilla, he says, is more like the Shinto “God of Destruction,” not human and not moral at all. As have been many of the earlier Godzilla films, this movie also pits modern technology and modern science against nature. Modern science and modern technology—especially weaponry—really only feed the monsters and do nothing to save humanity. Only when left to its own devices can Nature (Godzilla) overcome the threats to the world. I really have no trouble with the current recurrent cultural bent toward nature. But I do find it atheistic! Our world has adopted both figures, the more benign and comforting Mother Nature as well as the frighteningly powerful and destructive monster Nature (Godzilla), to explain the world we live in. As a Christian, I do not believe in Mother Nature or Godzilla because I do not believe in a self-created, self-sustaining, self-preserving force called Nature. I believe rather in God the Creator who “through the Son created the universe. The Son radiates God’s own glory and expresses the very character of God, and he sustains everything by the mighty power of his command (Hebrews 1:2-3). There is nothing amoral about God. He creates the world and sustains it and holds it together because of His nature. There is purpose and plan in life and death; there is a beginning and an end, terminal warfare between Good and Evil, and, best of all—God so loved the world! Godzilla is a good Saturday matinee film! The well-known actors have almost cameo parts, which should tell you that the monsters, the battles, the action are what the film is about. It is not really one of those sneakily propagandistic eco-films that you have been mildly disappointed with in recent years, so go see it! But don’t forget that Nature is just as fantastical as Godzilla. Only God can save the World.